CLCT’s design experts reflect more than fifty years of experience assisting the legal community with technology advice and counseling. 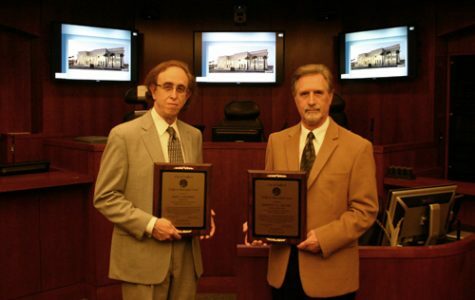 Whether designing entire courtroom systems from the ground up, advising on specific technology choices, or assisting in personnel training, CLCT is uniquely positioned to help, with its Director Fred Lederer and Deputy Director Emeritus, Martin Gruen. CLCT’s experts have built dozens of high-tech courtrooms across the country and the world. The best example is William & Mary’s very own McGlothlin Courtroom – the world’s most technologically advanced trial and appellate courtroom. CLCT believes that technology design focuses on the unique needs of end users. That belief led to a “systems approach” to design. All decisions and advice revolve around the specific court and the individuals members of that court. Court needs and court culture are court specific. This approach maximizes the benefit of technology; it gives the user the necessary tools, while minimizing costs through omitting technology that is inappropriate for the context. For more information about consulting, please contact us at clct@wm.edu or 757-221-2494. This content has been updated on February 26, 2019 at 2:50 pm.